The games of the opening round were played on the next day by the opening ceremony which was held on May 9th at the Astrakhan State Drama Theater. The stakes at this tournament are extremely high, and not only due to high prestige of winning the event, but also because one can win here a ticket to the candidates matches. Perhaps this was the reason for a rather peaceful starting round: there was just one decisive game, in which Vugar Gashimov, playing White, defeated Vassily Ivanchuk. In this game the Azeri grandmaster selected a quiet variation of the Ruy Lopez. Ivanchuk tried to create active counterplay in the center, but he was unable to seize the initiative, and Gashimov got a notable advantage after opening the f-file. White pieces were ready to attack the enemy king. Ivanchuk simplified his opponent’s task, missing simple tactics and losing the queen. Gashimov won the game on the 36th move. Wang Yue had White against Leko, and tried to surprise the opponent by playing a sideline against the Catalan. The Chinese grandmaster created doubled pawns in his camp, but the Hungarian reacted correctly, and neutralized White’s activity by timely queen maneuver. The players started repeating the moves early, and a draw was agreed fairly quickly. Evgeny Alekseev played a rather toothless line again Teimour Radjabov’s Gruenfeld, and Black equalized the game easily. The players traded some pieces and proceeded to an equal ending, where they agreed to a draw on the 25th move. Dmitry Jakovenko had Black against Shakhriyar Mamedyarov, and showed a strong novelty, improving Anand’s play from Kramnik-Anand match in Bonn. Jakovenko’s novelty was sufficient to solve Black’s opening problems, and Mamedyarov was unable to find anything better than forcing the game to an equal rook ending. Ernesto Inarkiev went for a completely non-aggressive setup against the Ruy Lopez, and Ruslan Ponomariov’s position looked rather promising. However, the Ukrainian played very solidly, did not avoid simplifications, and the game was agreed to a draw on the move 41. Once again Boris Gelfand was unperturbed in his pet Petroff Defense. His opponent Vladimir Akopian managed to squeeze a very slight advantage out of the opening, but Black’s accurate play allowed him to equalize completely in the endgame. The game between Pavel Eljanov and Peter Svidler was the longest in today’s round, and the Ukrainian grandmaster was close to a victory. The Russian implemented a new plan in his favorite Gruenfeld Defense, however, it didn’t help him to equalize the position. Eljanov played very confidently in a complicated endgame, gradually increasing his advantage, and at some point had a winning position. However, Svidler managed to sharpen the game up, and survived in interesting complications without any real damage. A draw was agreed on the 44th move. Radjabov, Wang Yue, Gashimov, Leko, Jakovenko and Ivanchuk all have a chance to finish second in the overall standings of the Grand Prix, which would give an opportunity to continue challenging the World Championship in the candidates matches. 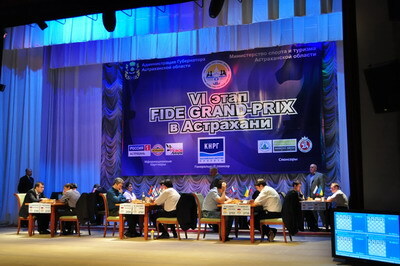 We expect these players to be the main contenders at the Astrakhan stage of the FIDE Grand Prix.